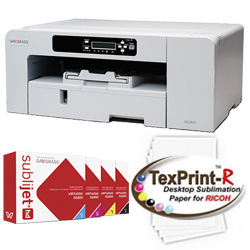 Want Help Selecting The Right Sublimation Printer For Your Application? Wholesale To The Trade - We Have Everything You Need! 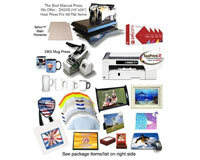 Produce High Quality Sublimation Products Your Customers Will Love! Custom shirts, mouse pads, mugs, caps, tiles, tote bags, iPhone and iPad cases, photo frames and hundreds more! We specialize in helping decorating and printing businesses add new technologies. How can we help you? If you have a related coupon, it can be used for all packages below! Sawgrass Virtuoso SG800 Sublimation System w/ SubliJet HD Extended Cartridges!